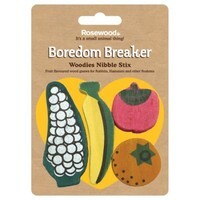 The Rosewood Boredom Breaker Fruit Shaped Nibble Stix are traditional wooden chews that will provide your pet with hours of fun. These colourful and vibrant gnaws will help to satisfy your pets natural urge to chew. Brighten up your pet's home with these fun and eye-catching chews.